Blue finish gramophone in very good original condition, with the record carrier tray, all good chrome fittings and correct soundbox. The best sounding portable, and one of the rarer colours. A few years ago these were selling for up to £350 and are still sought after. 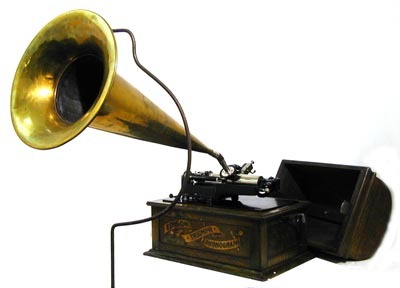 Portable gramophone. 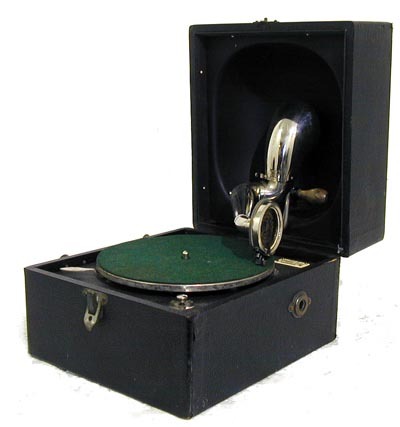 Small size portable, with an 8" turntable which fits the 'Broadcast' records sold at Woolworth's for 6d. Presumably these were also sold by that famous chain, and indeed it has outlasted them. Very good condition, an attractive little gram and quite rare considering it must have sold in large numbers. With a 'Broadcast' record in the lid storage. 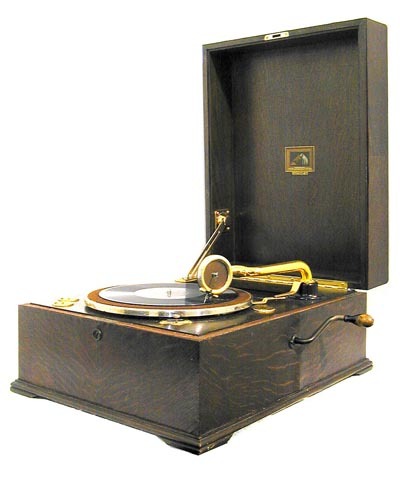 Mahogany table gramophone. This machine is in absolutely lovely original condition, you can put this straight into your living room and it won't look out of place. Nice rich red patina with no crazing, often a problem with this finish, all plating good and it plays fine. Basic model with no auto brake. One of the best you will find. 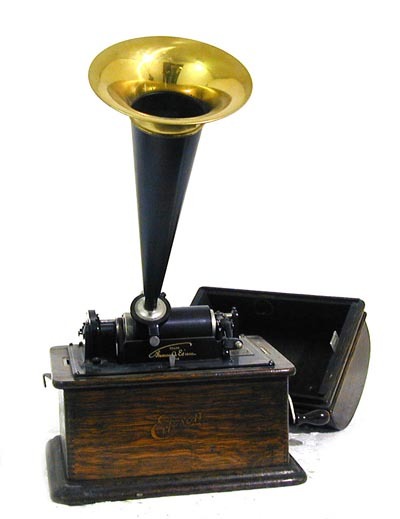 Phonograph c. 1909. The Fireside is a 2-speed model, and this one has been restored to a high standard, the deck plate having been re-lined etc., and the cabinet repolished. (The lid clips are missing.) A very good and collectable machine which will play the much more numerous Amberol cylinders. Has a good original looking brass horn. 3 4m. cylinders included (more available). c.1904. The largest machine made by Edison, it has a very heavy deck with a large triple-spring motor. This is an early model A, but fitted with the 2 speed 'Combination' gearing, so will play all cylinders. The condition is generally good, the deck plate and all visible parts being very nice and original. The lid is good, and the case has the early 'Banner' transfer. It has a lovely very original 24" brass horn and an original floor standing crane, but there are a couple of mechanical problems. The governor is missing, and the winding handle is the wrong type. c.1905. Another little 'Gem'! This one is complete but is mechanically not as good due to distorted pulleys. It looks OK, the lining and Gem transfer are fine, and it plays. (It is what you will probably get if you buy one on eBay described as 'mint'.) Has a repro alloy horn. Good banner transfer, but some veneer missing from lid edges. Bargain price. c.1905. 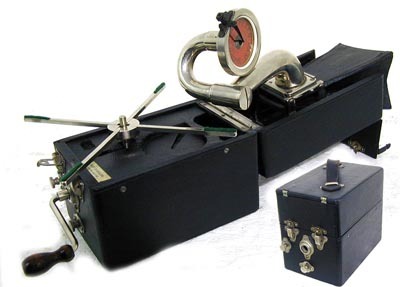 A well known machine, the smallest of the Edison range and made for several years. This is a very presentable example, the better of the two available. It is clean and tidy, and plays fine. Has a repro 'Witches hat' horn. Good banner transfer on lid. 1940s Japanese made 'picnic' folding gramophone, in crackle finish. 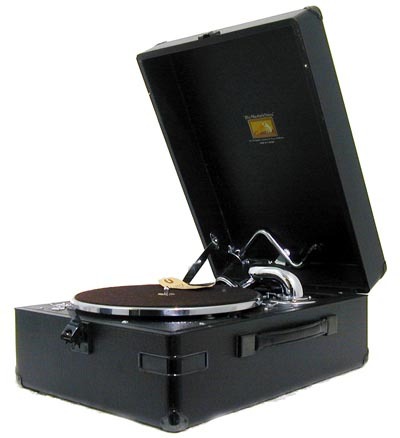 Ingenious folding mechanism with a horn which uses the record as a reflector. very clean original condition, a couple of minor rubber parts perished but otherwise excellent. Rare item. c.1906. A very good, clean original Standard, plays very well and has a nice genuine look to it. The horn is a repro 'witches hat' type, but everything else looks 100% original. A fine example of this popular machine. Brand new old stock gramophone. Yes, really! Appears unused- has label still tied inside. Don't think it has ever been played. No visible marks or damage, as new. These were still made in the 50s, so not unbelievable, but still rare. 1920s picnic gramophone. This is quite a well known model, but complete examples are not easy to find- and examples like this are rarer still. Absolutely superb clean original condition, all correct. 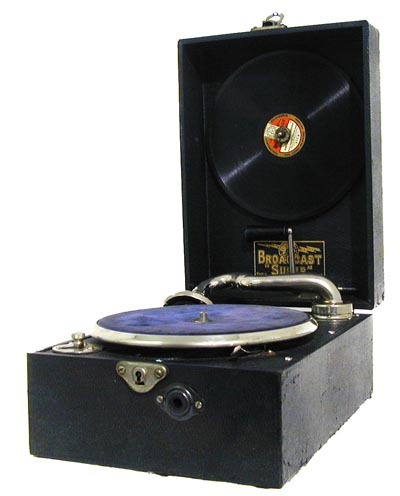 About the size and appearance of a large box camera, it folds out ingeniously to make a gramophone. Decca Junior gramophone, 1920s. Reflector bowl type, sometimes called the 'trench ' model (although most , like this one, are post WW1.) Clean, good rexine, original soundbox. Plays well. 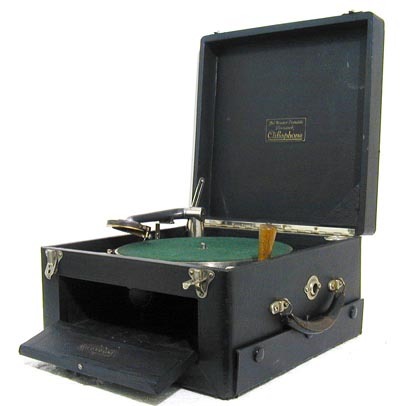 Columbia model 100 portable gramophone. Very good condition, hard to find as good as this, all correct and good covering, plays well. 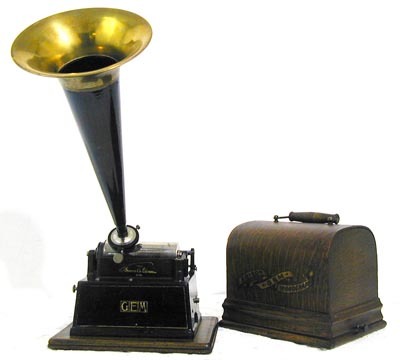 Compact portable gramophone with unusual arrangement of a reflector and small horn on the back of the soundbox. Actually sounds very good. Only small, about 10" wide. Superb original condition. 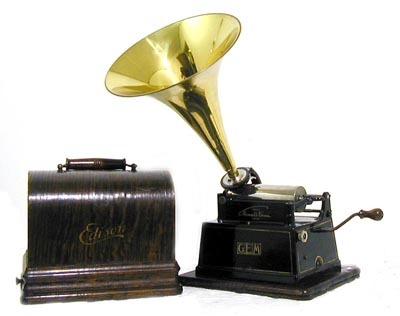 Edison 'Home'Phonograph, c. 1905. This is a more unusual model, being larger than the Standard, having the feed screw in line with the mandrel. This one has the 2/4 minute 'Combination' attachment, the larger model 'O' combined reproducer and is fitted with a nice 'Cygnet' horn and original crane. (Lid not shown.) This is a fairly rare machine, very genuine and original. 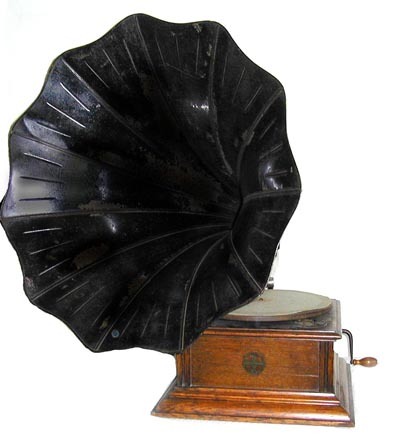 Zonophone HWO Horn gramophone. 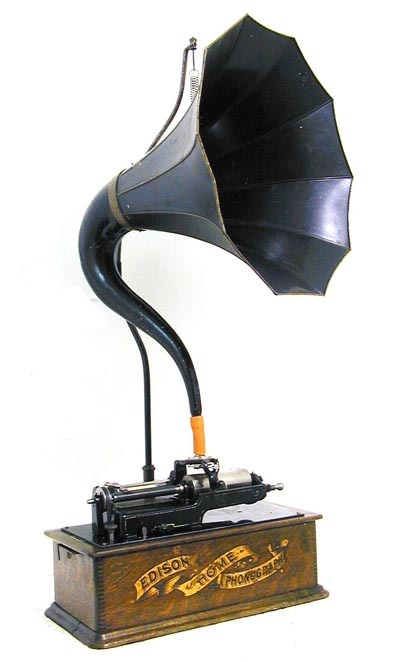 c1925.This is a 'clone' of an HMV, as they had long ago taken over the Zonophone company. 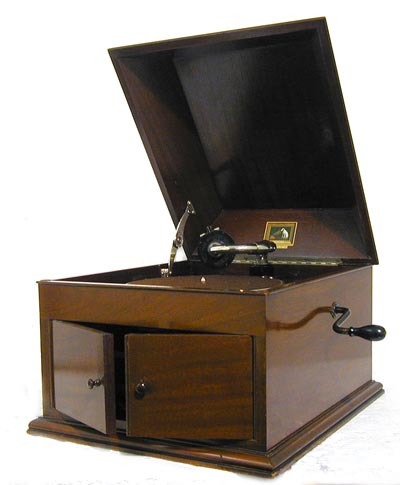 It is very similar to the HMV Model 5, oak base, Zonophone 'Exhibition' type soundbox. Nice original black 'Morning Glory' horn. The elbow and tonearm have been re-nickelled but all other finishes are original. A very nice genuine machine. 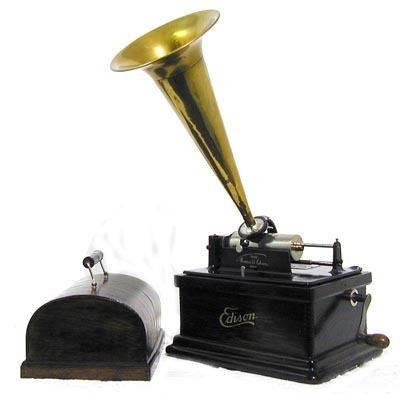 Edison Standard Phonograph c.1906. This is a really good clean machine, one of the best of this model we have had. Just nicely patinated but still bright, it has an original early type of tin horn. 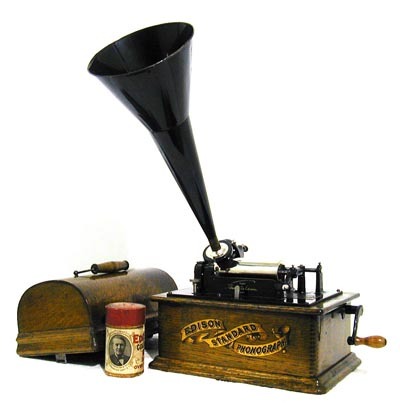 It has the 'Banner' transfer and green tint of this era, and with a good lid and original paintwork it is a very fine example of home entertainment technology of over a century ago. Just wind up, put on a cylinder and play- will someone be able to do this with a 103 year old CD player? HMV 'Library Bijou Grand'1911. One of the earliest cabinet models made under the HMV trademark. It is a very tall, slim cabinet in classical style made of solid light oak with inlaid stringing. The motor is the early triple-spring 'rocking turntable' type. 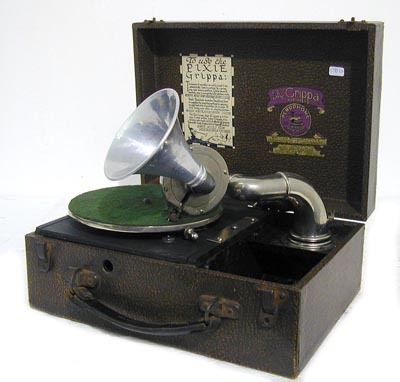 Cliftophone Portable gramophone, unusual patented horizontal soundbox. 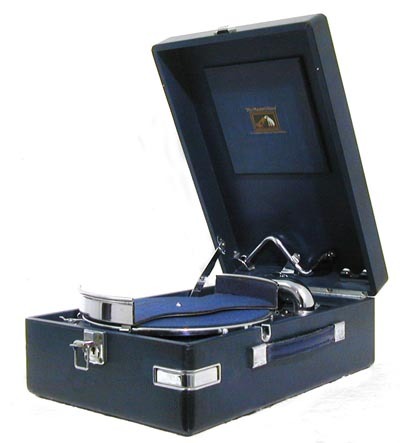 Nice clean unusual portable gram, compact, has record storage, with copy of period advert. 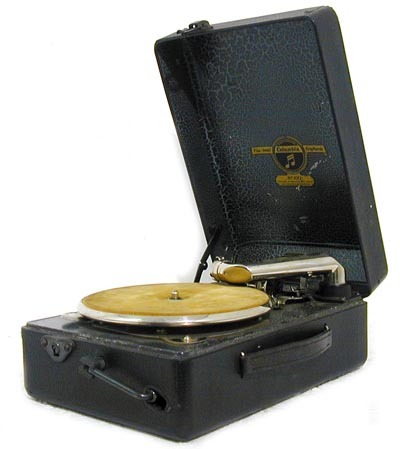 HMV Model 461 1926. Interesting and quite rare gramophone. The Lumiere diaphragm model 460 was introduced the previous year but was a commercial failure. The sound was not as good as the best horn machines, and the price was too high. The model was discontinued and the cabinets that had already been made were used to house a conventional horn machine with gold fittings and No. 4 soundbox. Quartered oak veneer cabinet, gold fittings, No.32 motor with 'speedometer', and internal horn. Remarkably good sound.